After visiting the Bluebell Railway on Sunday, I thought it would be a good time to post a quick update from Sheffield Park works. We begin with a brief look of recently overhauled Maunsell Q class 30541, sporting (for the first time in preservation) a British Railways late crest, as pictured above. I was hoping that I might catch it running on test, but it wasn’t to be and to be fair the Bluebell Railway nor did I expect it to be! Seeing it run again gives an excuse to visit the line at least one more time this year! BR Standard Class 5MT 73082 Camelot is still being worked on. As reported previously, the boiler has past its’ boiler test, and work is continuing, but it has yet to be reconnected with its frames, as can be seen above. South Eastern and Chatham Railway C class 592 was in the works giving an excellent opportunity to look at the inside of the cab! 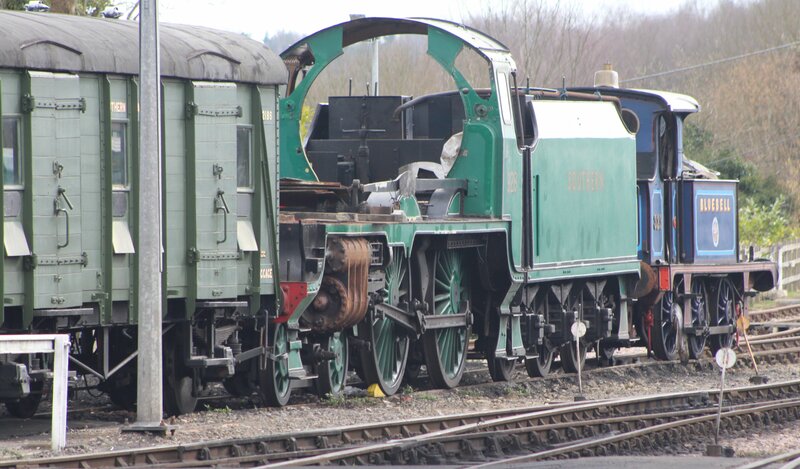 Last September the Wainwright ‘C’ Preservation Society gifted the locomotive to the Bluebell Railway Trust, ensuring the locomotive’s future on the railway. Signs of other locomotive overhaul projects were evident, including the frames and tender of schools class V 928 Stowe. It is pictured above in the yard besides P class 323 Bluebell. Another locomotive that will join the operating line up in the future is rebuilt Battle of Britain class 34059 Sir Archibald Sinclair. The tender and frames were on display in the engine shed. 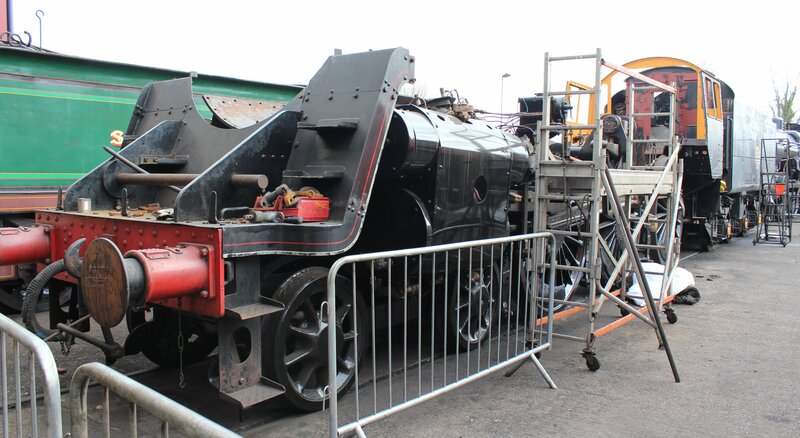 The locomotive was withdrawn for extensive repairs to the firebox, that are currently underway at LNWR Heritage Centre, Crewe. 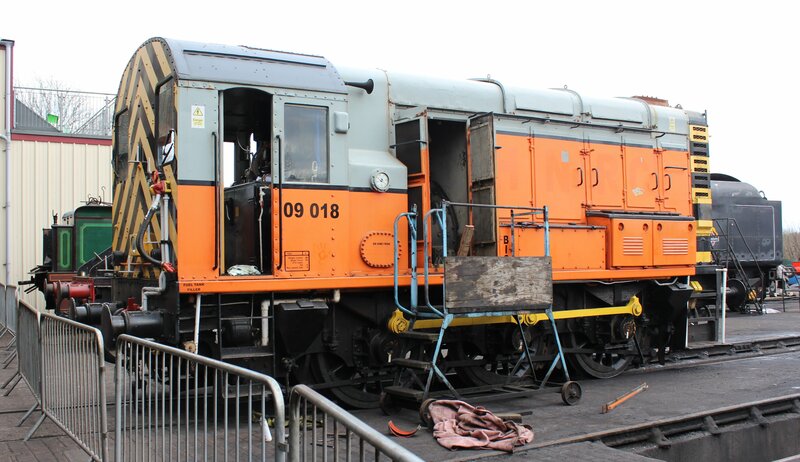 Finally we have a look at the modern heart of the yard – class 09 diesel shunter 09 018. It still seems strange to see a diesel locomotive on the Bluebell Line, after years of hearing that the Bluebell Line is 100% steam. It makes perfect sense for the line to use diesel locomotives however, especially for non-passenger carrying duties. They are much more cost effective and save on wear and tear of the steam locomotives and I’m sure by the next visit I will be used to seeing and hearing the odd growl from a diesel locomotive!